This is the second in our series regarding the roots of Lincoln City. 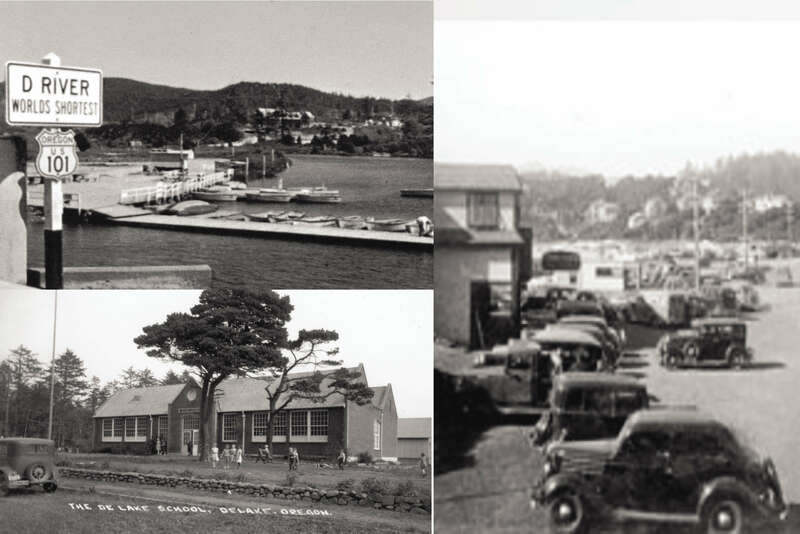 This article focuses on Delake, one of the five original communities of Lincoln City, each with an interesting past. Delake was one of the towns that sprung up after the Dawes Act in 1887 offered eighty-acre allotments to Native Americans and settlers. By 1924 Delake had a post office and a general store. The Roosevelt Highway opened in 1926 making it easier for people to reach the town and the population grew quickly. You know you’re in what was once Delake when you see the “D” River. Guinness World Records recognizes it as the shortest river in the world, but its state recreation site is one of the busiest on the Oregon Coast. Its home to the spectacular, world-class Lincoln City Kite Festival scheduled for June 24th and June 25th this year. Competitors from around the globe show off their creations and skill, but anyone can join in if they register. The official boundary of Delake is actually seven blocks south of the river, where you’ll find the Delake School seen in the photo (courtesy North Lincoln County Historical Museum). The Lincoln Cultural Center operates there now, but when the school was completed in 1929 it was the first in the town center. It accommodated the many grade school students in the rapidly growing community. Before it was built, many students walked up to four miles to attend classes. Today, you can take an art class, what a magic show, or enjoy a special event in the facility. Old Delake bustles with tourists now and offers modern amenities. However, the miles of sandy beaches and the sense of community remain. It’s still a great place to grab a burger, chat with a local, and experience the glory of the Oregon Coast. Lincoln City has much to offer, including many snippets of Oregon’s colorful past. Its oceanfront is also the ideal place to watch the grey whale migration, trap a Dungeness crab, or dig for razor clams. The city offers incredibly fresh seafood, microbreweries and wineries, and untouched wildlife reserves too. If you like to fish, steelhead, bass, sturgeon, and trout abound so you won’t leave empty-handed. Of course, the kids can explore the tidal pools, visit an arcade, or check out a movie at the local theater. If you’re interested in exploring the area, why not stay in one of our Lincoln City oceanfront rentals? They’re affordable and offer all the comforts of home while you explore Lincoln City and its charms. Rentals include stunning ocean views and high-end amenities including HDTV, wireless internet, an exercise room, a heated indoor pool and a games room, just to name a few. Why stay in a stuffy, pricey hotel when you can stay in a spacious, well-appointed condominium instead?